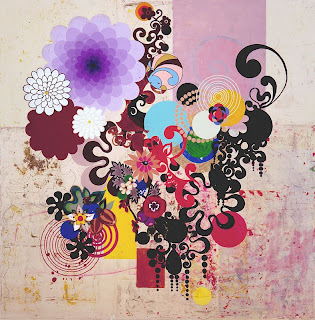 I really like the work of Brazilian artist Beatriz Milhazes. Her paintings are colourful, bold and full of energy. 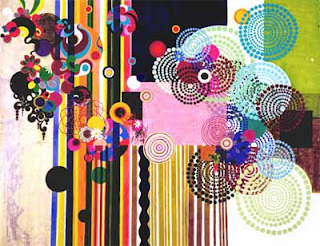 She creates vibrant layers of motifs and patterns, fusing images inspired by sources as diverse as folk art, embroidery, carnival imagery, geometry, botany, music and modernist abstraction. The artist applies paint to plastic sheeting which when dry is peeled off, carefully positioned and glued onto canvas to achieve extraordinarily smooth surfaces. Milhazes uses contrasting colours to great effect, her painting are in no way subtle.